There’s a spot in the garden that doesn’t hold moisture, no matter how much I water it in. In fact water seems to literally run off its surface or pool on top. This would normally not worry me sleepless if that wasn’t for loosing crops to desiccation, starvation or disease, or for wasting energy to keep that area moist. The issue here is not how much we water the area, but instead, how the soil reacts to that water. So the problem is the soil. 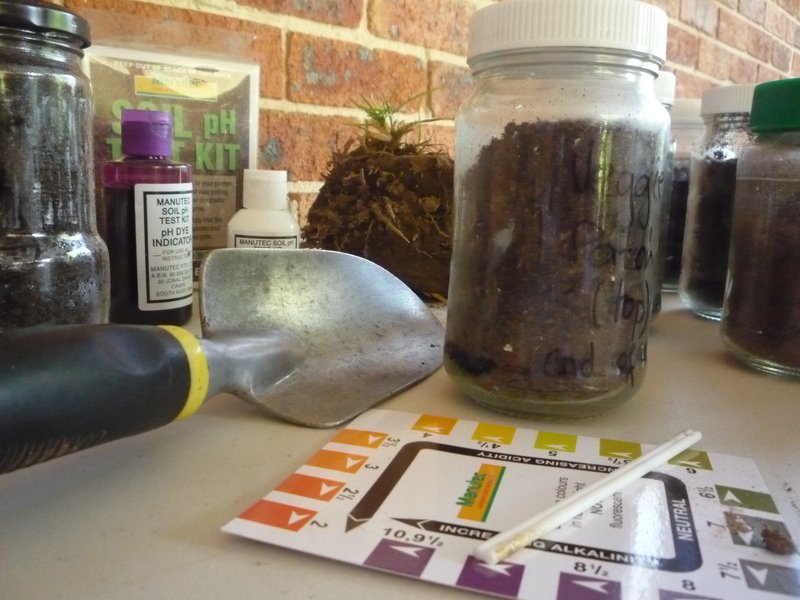 I like to do this easy soil test regularly and observe how my various soil amendment techniques impact the structure and nutrient availability of the soil. 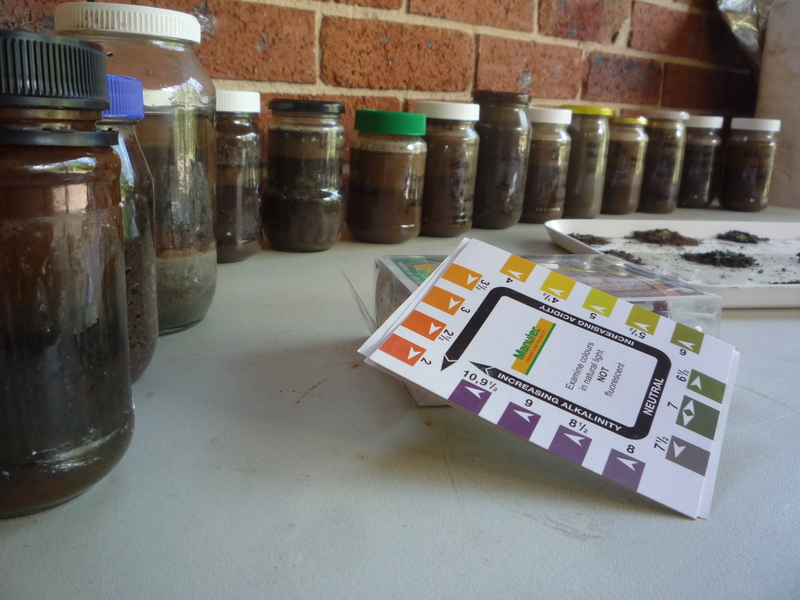 It is called the Soil Jar Test – a very scientific name indeed! I do this test in conjunction with a pH test which kit I bought at my local nursery. Scrape the bulk of surface matter (grass layer, leaf litter, etc). Fill jar with water, cap and shake vigorously for 1 minute or more. Let it stand for a day. Coarse grits sit at the bottom, followed by finer sand, then silt (very fine brown particles), then clay (even finer light coloured particles), and finally organic matter. There was no clay (which helps bind soil particles together and hold moisture); only a lot of sand and silt, which both are notorious for their hydrophobic properties. Only a few particles were floating at the surface of the water indicating that the bank of nutrients was rather depleted or simply non existent. The water was very clear, indicating very poor nutrient availability. Indeed, the browner the water the more nutrient is readily available for plant uptake. Wetting agents help the soil absorb water. I make my own as it is easy, cheap and I know what’s in there. 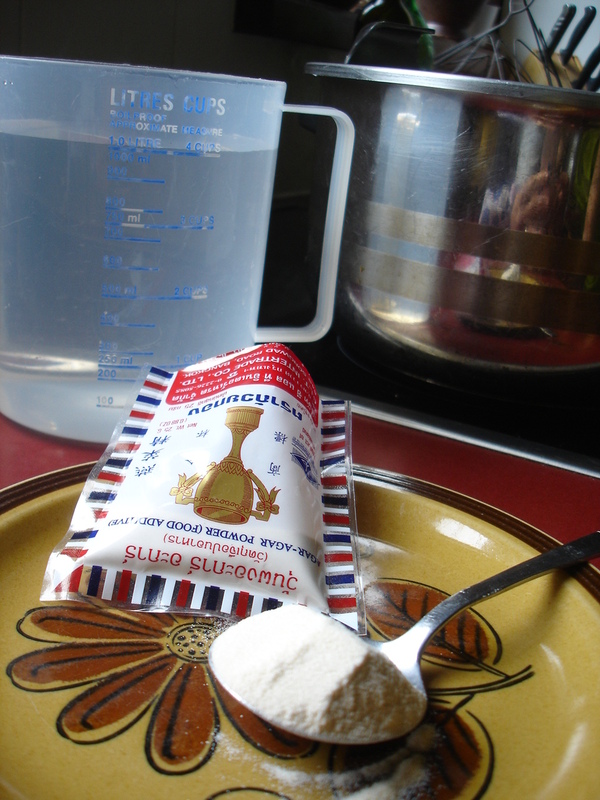 In 1l of water, mix 10gr of agar agar and cook as instructions on the packet. It should have the consistency of wallpaper paste. Add 2 cup of that paste in a 9l watering can, mix well and pour over the soil. Repeat the process after three days. This is only a quick fix solution. Organic matter attracts and nurtures soil life. Compost worms, slaters, springtails and all the other microbes live, feed, reproduce and die, altogether enriching the soil with nutrients and moisture. I like to add an even mix of green and brown material. It favours the worms and other soil biota such as mycelium and bacteria that feed on both ingredients. Water in with some worm wee or just water. Cover the area with at least 10cm thick mulch. I find sugar cane mulch can sometimes mat the surface and prevent rain to penetrate or soil gases to circulate freely. But it comes in cheap, it’s a by-product of the sugar industry, and it is conveniently packaged (although I do dislike all this plastic wrapping). I therefore only now use straw mulch which I buy from my local feedstore or in bulk straight from the farmer. I also used to mulch with dry grass clippings but it sometimes inoculate my garden beds with unwanted kikuyu seeds… aaaaargh a nightmare!! Another strategy I find to work with that kind of soil problem is to choose to plant species of plants that strive in that type of soil. Work with what we have is my motto. I find it the ultimate energy-saving and resources-conserving way to gardening, and living. So, if the soil is naturally, intrinsically, dry, water-repellent and nutrient poor, isn’t it a better strategy to plant drought-tolerant, nutrient-enriching species of plant? I have trialed Pigeon Pea, a leguminous, nitrogen-fixing perennial shrub that strives in poor and dry soils yet it can tolerate irrigation… I will report back in another post. thanks for the awesome info, I’ll try and find some agar agar! When the soil in our vegie patch becomes hydrophobic, after the close by Eucalyptus tree roots have invaded, I poke the pitch fork into the soil to add air. Once the air pockets are in I then water until saturation point. Then I add a good 10cm layer of home made compost on top and use the mulch hay to cover the soil. This works well only if the soil has already been improved.